Bitshares and its sister graphene chains share a similar governance structure. It's built right into the guts of the chain. If you've spent any time listening to @dantheman, you are well aware of his passion for governance. Let's review the categories of voting and begin to understand the roles they play. Witnesses are the work horses. Every time you perform a transaction on a graphene based blockchain, the witnesses take turns validating transactions. This happens in a round robin fashion at 3 second intervals. Witnesses get paid. People must maintain hardware, typically several unix machines and demonstrate that they can keep them up reliably. If you vote for a witness and they are either idle or failing to produce blocks for some reason, it is in your best interest to remove your vote for that witness and pick someone else to do the job. I wrote a simple tool for seeing if any of your witnesses are failing to produce blocks in a timely manner here. Look at the link associated with each witness. Does it point to information about their contributions or mission? If not, ask yourself why you are supporting them. Committee Members make decisions about fees, features, forks. Important stuff! They too have links to information about themselves. The same reasoning applies to committee members as to witnesses. Vote for those individuals who you believe will benefit Bitshares for the long term. There is no minimum or maximum votes required so take your time. Did you know that Bitshares has a pool of money that can be used to further enhance many aspects of the chain? It's true! 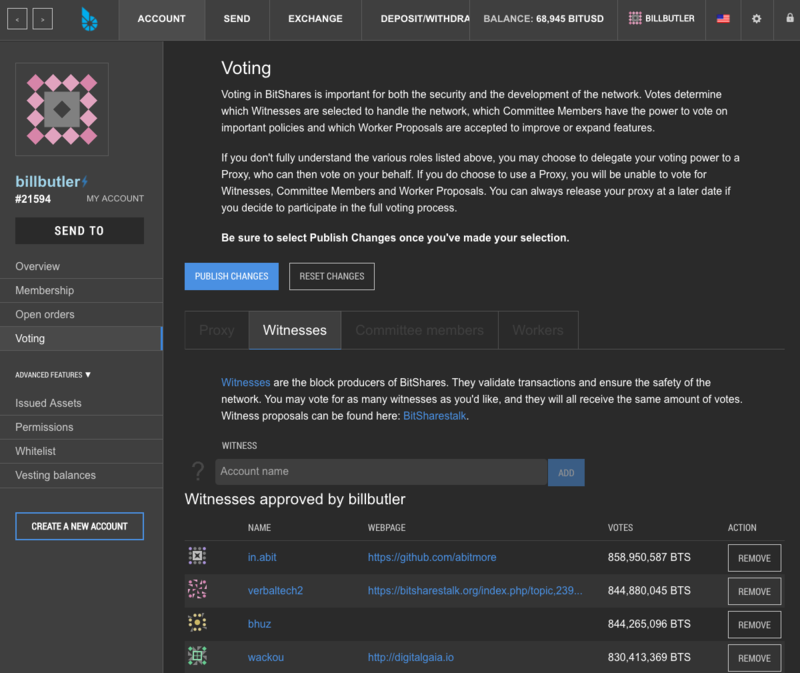 Bitshares doesn't have a "leader" but it does have governance and you individually have the right to vote for worker proposals as they come through. These proposals are rather hidden in the wallet and a little ambiguous to read, but they too matter. Individuals or teams can present a plan to enhance some area of Bitshares for a proposed price. If accepted, the worker is paid daily until the contract terminates. It all happens automatically on the blockchain based upon votes! Pretty cool. Looks like I'm voting for witnesses who are doing their job, making blocks! Take note of the Blocks Behind number. If you are voting for witnesses who are behind on blocks, remove your vote for them! Keep in mind that since blocks are produced every three seconds, it's possible that a witness may be behind 3000 blocks and this might only represent an hour or so. Your concern is removing votes for those who are chronically behind. We haven't talked about proxies yet, but it's really the easiest route to go. Your proxy can vote for witnesses, committee members and worker proposals all on your behalf. Set it and forget it. It's my hope that you will choose me as your proxy initially and, as you gain more knowledge of the community, take back your voting rights. Follow the same instructions as the proxy, but instead choose either the Witness / Committee / Worker Proposal section. For witnesses and committee members, you can either choose from a list or you can type in a value manually. For each account you plan to vote in, click add. This will place it in your added list. You will also see a remove button the right of each witness / committee member. NOTE: your vote is not official until you click Publish Changes up top. I'm going to leave out worker proposals for now. It will make a good future article. Thanks for taking the time to read about Bitshares Governance. I encourage you to empower yourself in this community and exercise your voting privilege. Cheers! On a side note, I'm also lobbying to be a peerplays witness, so if you hold ppy, please vote for me once the chain goes live! Interesting. Going to look into Bitshares and create an account now. I recommend holding BTS for many reasons. Thanks for joining up. You'll never need to use another online exchange again. The only negative to the Bitshares DEX right now is low liquidity, but new people signing up and trading solve that problems. Great post, Bill. Resteemed. Happy to have my BitShares votes proxied to you as you're clearly putting in the time and attention this deserves. Thanks, Luke! I voted for your witness slot in steem as well. Good job and thank you for sharing. Thank you for bringing this to our attention. Many people have a lot to learn about this powerful technology, including myself. 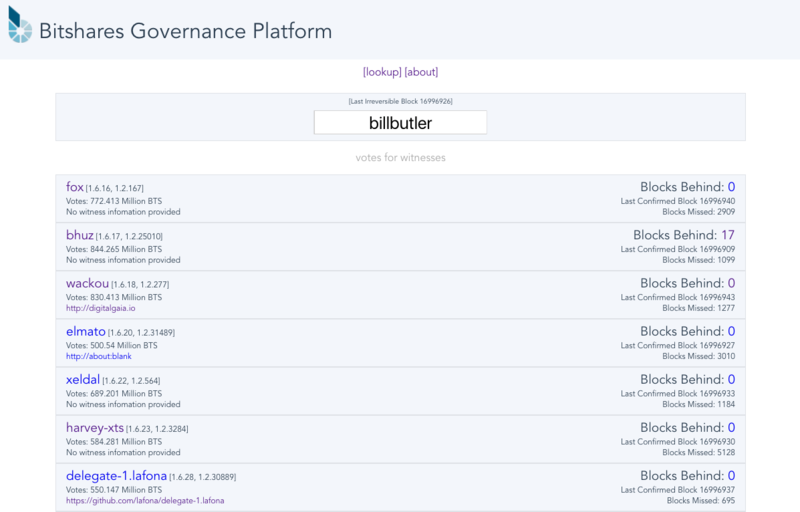 Followed and resteemed I hope more people get to see how governance works here and in bitshares, plus I just noticed "voting" just today and already you gave a great overview. Worker proposals can be initiated from the command line and voted on through the wallet, but the UI for the voting process and viewing of active vs expired proposals needs a bit of work. Hi bill, how or where can i see who voted for we. Are the 25 active witnesses support by some very big people.. how do you do active marketing? and how much bts do you have as active witness. I want maybe to give it a shot but need to have some info.. In steem it's hard but it looks like in BTS it is even worse.. This post has been ranked within the top 50 most undervalued posts in the first half of May 31. We estimate that this post is undervalued by $15.06 as compared to a scenario in which every voter had an equal say. See the full rankings and details in The Daily Tribune: May 31 - Part I. You can also read about some of our methodology, data analysis and technical details in our initial post.